In the beginning of January, I attended a meeting about a grant that CHC had received from the Department of Public Health. 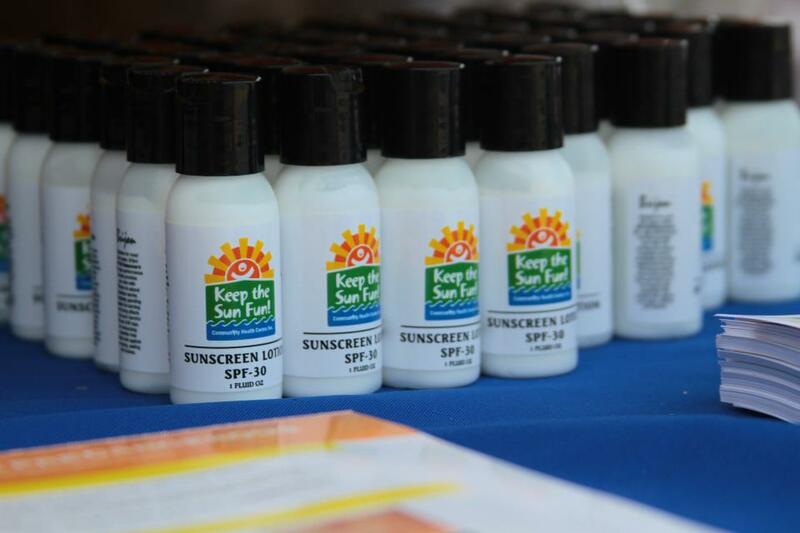 The grant was specifically for CHC to host a skin cancer and sun safety awareness event sometime during July which seemed like centuries away at the time. It was decided that the event would be called “KEEP THE SUN FUN” and the ball slowly began to roll in the direction of Hammonasset Beach State Park in Madison, CT.
After months of planning and a whole new outlook on sun safety thanks to plenty of research, the idea that was generated in January became a reality. Before I describe how awesome the event was, I want to share some of the common facts associated with Skin Cancer and excessive sun exposure which made the execution of this event extremely necessary. 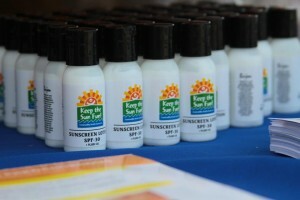 Each year, there are more new cases of skin cancer than the combined rate of breast, prostate, lung, or colon cancer. It doesn’t matter whether you consider your skin light, dark, or somewhere in between, ANYONE can get skin cancer. It was a little tricky trying to host an event at the beach promoting early detection of skin cancer while being surrounded by people soaking up the sun. Thanks to three generous Dermatologists from the University of Connecticut Health Center, we were able to set up a Hawaiian themed beach station equipped with private areas for beachgoers to get a free screening. 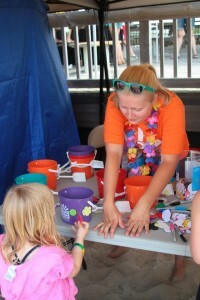 People were also encouraged to stock up on sunscreen, gather informational handouts, grab a few beach balls and Frisbees, and decorate a bucket and pail while waiting for fun glitter tattoos. Radio station KC101 came to play music and host a limbo contest during the event and we also had tons of hula hoops and bubbles to occupy anyone and everyone who came to check out the tents set up on the beach. 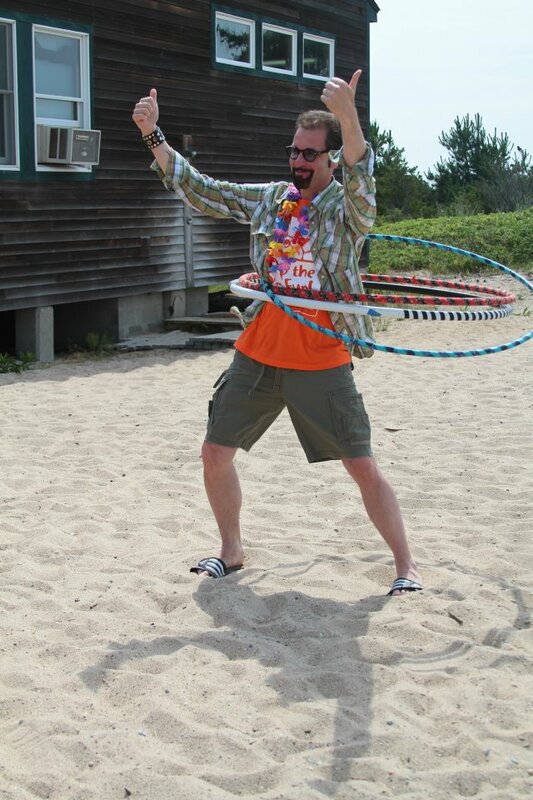 Hammonasset Beach State Park is Connecticut’s largest public beach and was a huge help in organizing the awareness event. They were very accommodating and let us set up on East Beach right in front of the pavilion; the event went from 10am to 2pm and the weather was beautiful (and we finished in plenty of time before a few rain drops headed our way). Right when the clock hit 10am, we already had about seven people waiting to be screened. Many of the lifeguards who work at the beach came over and got screened during their lunch break which was great. One man explained to me that he has been trying to see a dermatologist for over a year and wasn’t covered by his insurance. 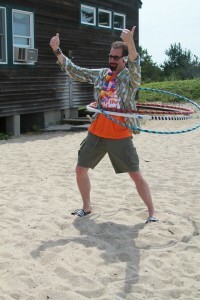 He decided to come to Hammonasset on Saturday morning on a whim and was overjoyed that he was able to get screened. In our budget from the DPH grant, there was money set aside to pay for a follow up appointment if a person needed it after being screened. Overall, we screened 127 people with 19 of those screened who were referred for follow up care. Throughout the event, more and more people kept commenting on how events like this need to happen more. The Community Health Center, Inc. was more than proud to be the organization who took on the challenge. If it wasn’t for members of the CHC staff, this event would have never been possible and they are greatly appreciated. 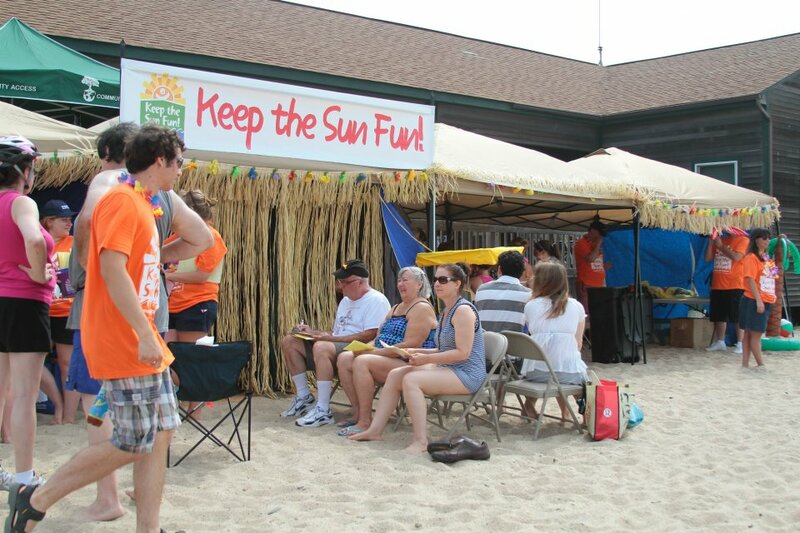 Organizations who also played a huge role in making “Keep the Sun fun” a success are the CT Cancer Partnership, Department of Environmental protection and of course Uconn Health Center and the Department of Public health who funded the event. I had a moment to chat with one of the Dermatologists before she left after the event. As I was trying to praise her for all of her work on that hot Saturday, she was thanking everyone who made this event possible and said that educating people is the number one priority right now. Some of the people she screened had never been to a Dermatologists office before and had no clue of what the sun’s harmful rays can do without proper protection. She was more than happy to not only show people how to monitor suspicious moles or lesions on their skin, but to also share with them ways to prevent damage from the sun. As you might be able to tell, this whole effort was a huge collaboration and once again, the Community Health Center is so grateful towards everyone who helped make it happen.